New Maple Leaf Quilters Chairperson , Nancy Smith will provide leadership for our group for the next year. 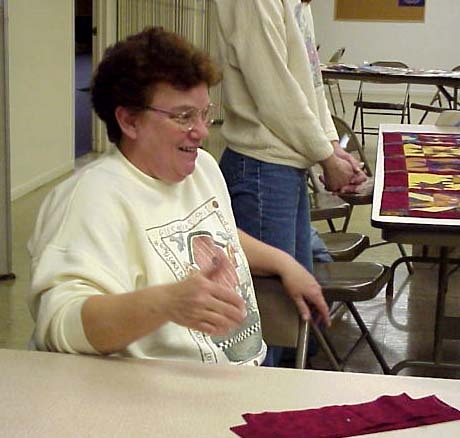 We want to thank Fran Hathaway for her great leadership during the past several years, serving first as vice chairperson during our planning for the 1998 Quilters Gathering, and then serving for chairperson for the past two years. Thank you, Fran, for the service and leadership. She has exended much thought, care and energy to her role for the Maple Leaf Quilters. We look forward to a new year of programs and activity with Nancy at the helm. 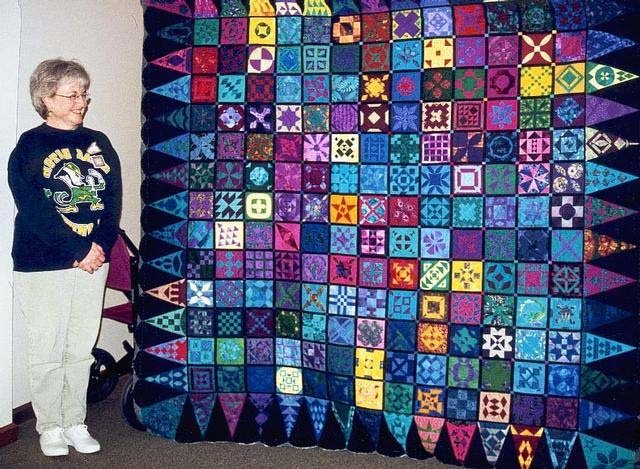 She has been actively seeking input from Maple Leaf Quilters on the kinds of activities we would like to see happen during the June 2000-May 2001 guild year, and she has been busy compiling ideas and contacting resource people and teachers. Be sure to let Nancy know if you have suggestions programs, workshops and activities. We also want to thank Edith Shanholt, treasurer and Paula Newman, secretary, for their contributions and work on behalf of the Maple Leaf Quilters during the past two years. The new treasurer will be Liz Martin Clark, and new secretary is Marie Troyer. Thank you both for your willing to hold these offices. Report on the Shipshewana Dear Jane Retreat. Look at the grin on Edith's face, moments after putting the final quilting stitches in her DJ at the Shipshewana Dear Jane Retreat. Cancer Treatment Centers of America Quilt. On Saturday, May 20, a number of the Maple Leaf Quilters met at Goshen Hospital for a Paper Piecing Workshop for CTCA Quilt. Liz Martin Clark is heading up a MLQ committe to design and make a very large "survivor" quilt to be displayed in Goshen's new Cancer Treatment Center. The quilt's theme is "Celebrate Life." It will feature a center medalion on point of an appliqued tree (CTCA's logo) on top of a watercolor background. The medalion will be surrounded by 6" paper pieced blocks, each in a "Square on Square" block setting. We will be having at least two paper piecing events to make blocks for the quilt. If you missed this first one, we hope you can participate in the Monday, June 26 evening guild meeting, which will be a piecing night. Please bring some nice (prewashed, 100% cotton) scraps for paper piecing. The blocks will include anything that "celebrates life" - flowers, trees, animals, activities, people, toys, events, etc. Smaller scale prints generally work best for paper piecing blocks since the pieces tend to be fairly small. We will provide instructions, guidance and tips for anyone who wants to learn the paper piecing technique. Bring a sewing machine. For more information contact Liz at 535-2834 or email lmartin@goshenhealth.com . Nine Patch Quilting Bees. On Monday evenings, beginning June 5, from 6:30 until ?, and each Monday evening in June (except the 26th) we are invited and encouraged to help with the hand quilting of the Maple Leaf Quilters Michiana Relief Sale Nine Patch quilt. Quiltings are being held at Edith's house. Monday, June 12, 7:00 PM. Sew What/Business Meeting. New Officers installed. AND quilting on the Relief Sale Quilt. Monday, June 19, 7:00 PM. Sew What/Business Meeting. Quilting on the Relief Sale Quilt. Saturday, June 24 Field Trip to Door Mouse Fabric Shop in Bettsville, OH. Nancy will be driving her motorhome and can take 13 people. If more people wish to go we will take more vehicles. If you would like to, please call Nancy at 293-3846 or email at Aztech.@prodigy.net. Monday, June 26, 6:30 PM Paper Piecing Workshop for CTCA quilt. Regular Meeting at Waterford Mennonite Church. We will be meeting at Patty Sliney's house for this meeting. Directions will be provided at the June meetings or call Patty, 875-8565 for directions. Middlebury Harvest Festival,, October 5, 6 and 7. Topeka Quilt Show and Sale, Topeka United Methodist Church. Located at the corner of Pine and Babcock street in Topeka, Indiana, this show is held on these dates: Wednesday, June 21, 10-5; Thursday, June 22, 9-5; Friday, June 23 , 9-7; and Saturday, June 24, 9-12. Quilts and items for show or sale should be brought to the Church on Monday June 19 or Tuesday, June 20 Between 9-4. This is quite a large show with many items for sale. Admission is $3, Exhibitors, free. All sales cash. Quilt Surface Design Symposium, June 11-23, Athens, Ohio. Brochures will be available at our January meeting, or visit their web site, http://www.qsds.com/symposium.html . The Symposium sponsors a two-week series of affordable training seminars, designed to provide hands-on training in a variety of Quilting-related textile art fabrication techniques and methods. Classes cover many topics ranging from physical construction techniques such as Fabric Dying, Fusing, and Collage, to developmental skills such as, putting together a presentation, and cultivating creativity. This Symposium is sponsored by Nancy Crow and Linda Fowler. BEAUTIFUL Handed Dyed Fabrics By Fran. Available for sale at our next guild meeting. Fran's fabrics were quite a "hit" at the Dear Jane Gathering in Shipshewana. Fran's got more fabric and new colors too! You can contact Fran through email at FranCanDo@aol.com. Your comments and suggestions are what help make our store better. Cindy sent us a "fabric gift" for a door prize for the May meeting. Be sure to visit their site. They have great prints and prices! Check out the novelty fabrics. I found a lot of new prints that would look great in an "I-Spy" quilt, including a must have "Animals On-line" print.